Mercy Thompson, one of my favorite paranormal/fantasy heroines of all time, gets herself kidnapped and almost killed. Waking up in Italy, a captive to a renaissance era vampire lord isn’t how Mercy had planned to visit Europe. Not being able to feel her bond with her mate Adam, and the Columbia Basin werewolf pack almost put her in a tailspin, but it doesn’t stop her from planning her escape and successfully fleeing her captivity. Of course not everything goes smoothly, and being related to Coyote, the king of chaos, you know Mercy isn’t going to be sitting quietly waiting for Adam to come pick her up. Somehow, Mercy jumps from the frying pan into the fire, and manages to break up a sinister vampire plot. Told from both Adam and Mercy’s perspective, you got a real feel for their bond and love for each other. 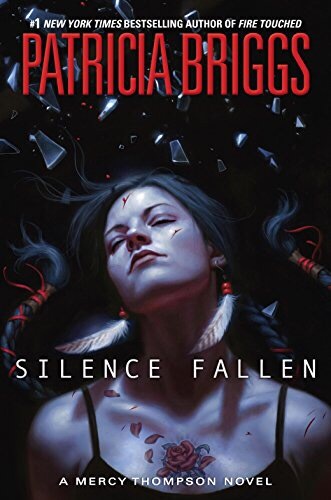 Silence Fallen’s plot was so intricately woven. Adam flies to Italy to “rescue” Mercy, but she’s not there anymore and he has to beat back his wolf in order to have a politically motivated meeting with the Vampire who almost killed his mate. You could practically hear the growl in Adams voice as he choked back his anger, fears and frustrations. In my opinion, we learned too much about the dynamics of a vampire seethe. Stefan and Marsilia’s past history in Europe was kind of interesting but I learned more than I probably needed though I’m sure that will come into play in future books.